For me the queen bee is very special. It is very inspiring to realize that one small bee can lay all the eggs in the bee hive. The total bee count can be in the summer in the 40 thousands. And all these bees are coming from only one bee. Off course the worker bees are equally important in the hive. But the queen is putting up the most stress. She is both the slave of the worker bees and the ruler of the worker bees. In this article we will follow the birth till dead of a new queen. Her royal majesty is hatched from a fertilized egg which has been treated special by the workerbees. Overall is the queen larger than her daughters. The most important difference is her developed rear abdomen, for reference see picture above. The abdomen has this size because of her developed ovaries, which are 7 to 8 mm long. The rear abdomen also has the perfect length for egg laying. The queen bee can easily place the eggs on the bottom of the cell. To become the queen, the new potential queen must follow a short but life threatening path. It all starts with a fertilized egg which is laid in an cell of the hive, which is located in the brood chamber of the hive. After the egg is laid. The workerbees decide which eggs will become potential queens, by filling the cell with royal jelly. The larvae will feed itself with the royaljelly after special growth is stimulated. Day 1 – 3: After day three a larvae will hatch from the egg. The larvae starts too feed itself with the food that is given from the other workerbees. Day 3 – 9: The feeding will continue for six days after the larvae will spin itself into a cocon and start to pre-pupate into a bee pop. This is after the workerbees cap the comb chamber with a small layer of wax. Day 9 – 16: The pupstadium only takes 7 days to complete. After which the queen will start to climb out of the queen cell. The total time for a queen bee to mature is only 16 days from egg to hatching. I find this really amazing. If you compare this to the workerbee which needs 21 days and the drone which needs 24 days or sometimes 25 days. A queen bee can lay eggs up to 5 years, normally after this time her spermatheca is empty and she can not lay fertile eggs anymore. When the queen is born she normally is not alone. The worker bees builded more queen cups to ensure there would be a next queen. The queen as a response lays more eggs in the available queen cups. After the eggs are hatched the worker bees will raise multiple queen larvae at once. So multiple queen cells can be available at the same time in the hive. 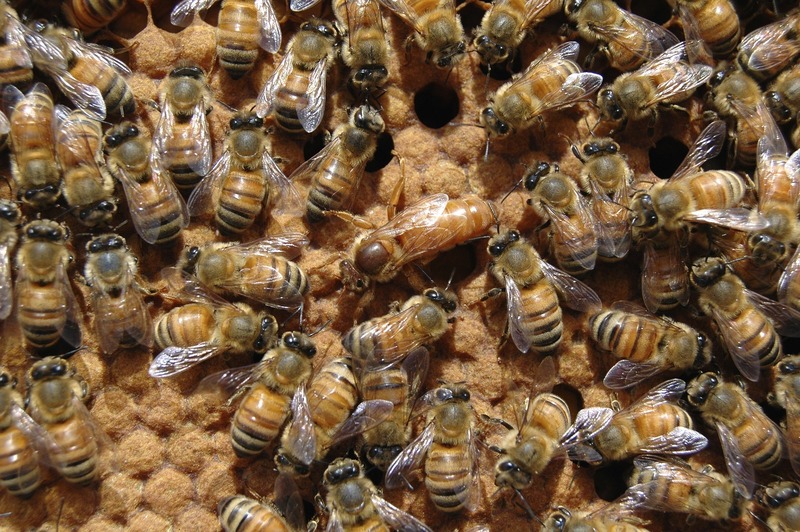 The existing queen in the hive can lay eggs in queen cells for several days after each other. The yet to be born queens all have different ages. Some queens only differ a few hours from each other, others differ several days. The first queen that hatches from the cell is one of the main contenders for the throne. She starts to make a noise which is called “Quaking”. As a beekeeper you can hear this sound if you put your ear against the outside of the hive. You will hear a quaking sound. This sound is made by the queen to alert the other queens in the cells the hatched and is ready to fight for the throne. Queens can make this sound by pressing their chest to the wax comb. She will vibrate her chest muscles which will produce the sound. As a response to quaking the other queens still in the cells will start making sound as well. Because they are still encapsulated in their cells this sound has more a “tooting” sound. The queen which is already hatched from the hive will start to move to the tooting cells. She will sting her sister queens to dead. Only one queen will remain after stinging. This is only the case for the bees who make noise. Queen bees who differ in age will not be stung, because they do not make any noise yet due to not being fully developted. After one queen bee remains she will have to fly outside of the hive to propagate. She has to fly to the nearest drone congregation area were drones are waiting to mate with the queen. A queen bee will normally mate with around 20 drones to fill her spermatheca. She can store up to 6 million sperm cells. She will use these sperm cells to fertilize her eggs. A virgin queen flight can be very dangerous for a hive. The hive needs the queen bee to ensure healthy genetic offspring for the hive. If the queen is flying outside to start her propagating journey. A majority of the bees are start fanning with their butts in the air. Pheromone is added to the air so the queen bee can find her way back. When the queen bee arrives back into the hive she is taken in as a true hero. The future of the hive is ensured for the coming year. When you have a young queen in early summer into your hive, we normally can reduce the hive inspections because the swarm fever in the hive is reduced. A young queen bee is likely to swarm. When the queen bee arrives back from her journey outdoors she will start laying eggs in the coming days. Normally we leave the hive at peace for a minimum of three weeks. The hive can start up with a new queen and the queen can get used to the hive. The queen bee does not feed herself, she will be fed by the worker bees. Worker bees regulate the amount of food she will get. When swarming is imminent or the end of the season is approaching the queen bee receives less food and starts a diet to reduce the egg laying. The queen is at the same time the ruler and the slave of the hive. A queen bee is always surrounded with about a dozen bees. These bees have the task to feed the queen. The queen bee is fed royal jelly, which is produces in a special gland in her forehead. This royal jelly is also fed abundantly to the larvae in the queen cup.